The threat of a starship being boarded and captured by enemy forces appears often in Star Trek franchise. On some occasions, such an operation is successful and the enemy gains the control over the starship. Such a starship is of great value for the enemy's intelligence services and would most likely be disassembled and studied by them. However, in situations when the ship's design is already known, or several ships of the same class are captured, there is no need to disassemble every one of them. Such ships can be manned by the enemy and be incorporated in the enemy's fleet. 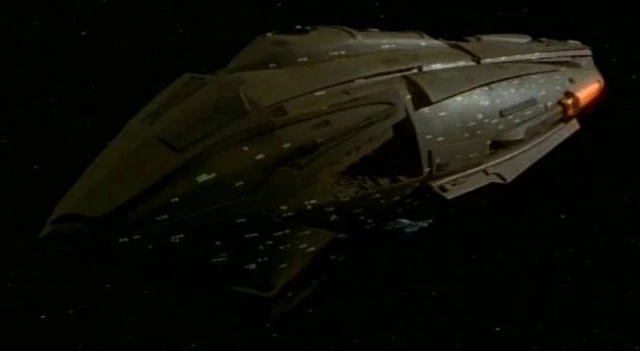 There have been episodes in which a captured enemy ship is used for covert operations, however these ships do not last for long (like the Dominion's ship used by Starfleet). A captured ship used by an individual and not in actual control of enemy's fleet (like Dukat's Bird-of-Prey). A captured ship used in one major operation and not used continuously by the enemy due to its destruction / becoming disabled / not being shown ever again (like Jem'Hadar fighter captured by Starfleet). NEELIX: They're Trabe vessels, actually. Everything the Kazon have, they stole from the Trabe. Mabus will tell you all about it over a sumptuous dinner. The food hasn't been very good where we've been. While Terok Nor isn't technically a ship, it is capable of moving around inside the Bajor system under its own steam. It's renamed Deep Space Nine and is used extensively by the Federation and Bajorans. U.S.S. Defiant, NCC-1764, Constitution class cruiser. The Tholian Assembly in TOS S3E09 "The Tholian Web"
The Terran Empire (Mirror Universe) in ENT S4E18 & S4E19 "In a Mirror, Darkly"
There is another example of this that seems to have been missed. Although it didn't last too long, the Nyrians captured Voyager in Displaced. After all the Voyager crew were replaced, their leader stated "Your vessel will be used to defend Nyrian acquisitions." Not the answer you're looking for? Browse other questions tagged star-trek spaceship or ask your own question. Do we ever learn what the Prophets did to the Dominion Fleet? Have we ever seen TIE fighters/bombers operating in atmosphere before? Have we ever seen the Romulans successfully outmaneuver any other race or political group? Have we ever seen a female Borg drone 'extra'? Why doesn't Star Fleet use holographic sentinels to protect the ship when boarded?